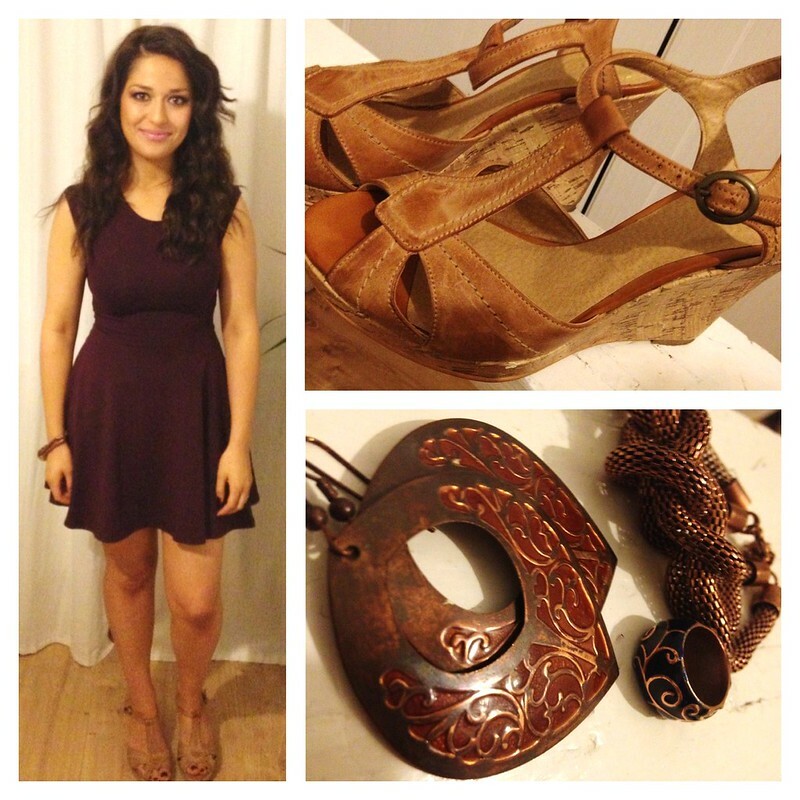 Galapagos Love for Date Night! Friday night was a long overdue date night! It's actually the first date night that I have got ready without Esra as we dropped her off to my mamas prior to getting ready! All the other date nights were me getting ready with Esra and my mama coming over just before heading out which meant rushing everything. This time I actually did my makeup and hair properly! *Hooray* :) I have a new found love for Nars 'Galapagos' eyeshadow which has been on my wish list for years, I am also loving By Terry's 'Touche Veloutee' under eye concealer, it's a must have for tired mamas and anybody that wants to look awake, worth the hefty £35 price tag! I used the shade 'Galapagos' which is a bronzed brown with finely milled glitter all over my lid and blended it out, I used some of the other colours in the palette to add definition and highlight. The limited edition 'American Dream' palette by Nars is actually REALLY amazing and deserves a post of it's own. Swatches and comparisons coming soon! I will also be doing a before and after with the By Terry concealer just to show you how effective it is! I wore my new dress from Topshop which I am in love with. It's so flattering and I love the deep red, maroon shade! I teamed it with wedges, some brass jewellery and a white slouchy blazer. Hope you are having a fabulous weekend! I think I have gone a bit crazy with the labeling, this time I have managed to label my entire nail polish collection and I'm in LOVE! 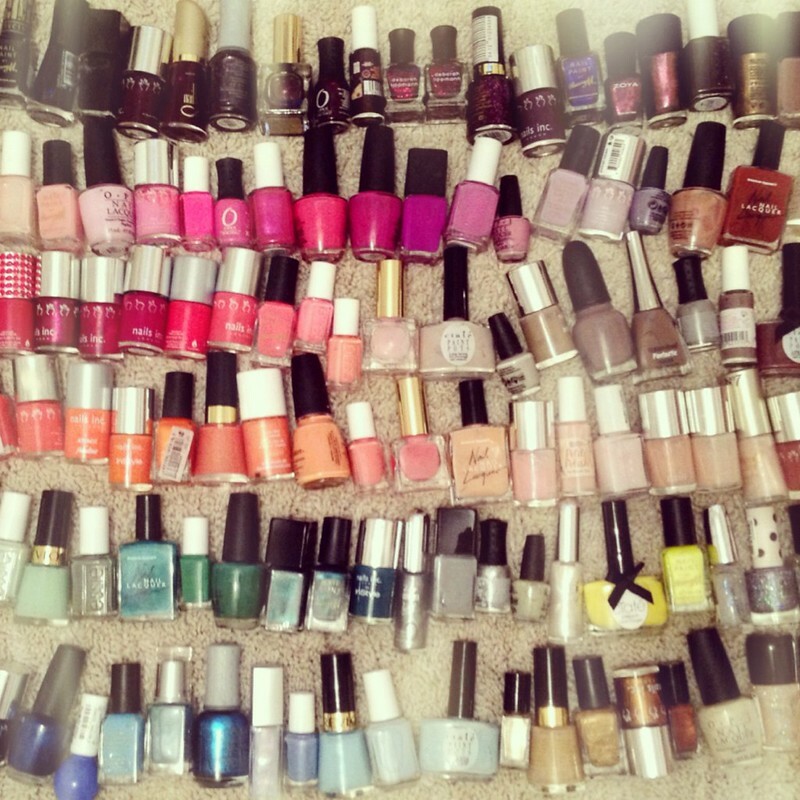 You see I have a lot of nail polish and can never find what I am looking for. I hate rummaging through boxes, drawers and bags! Now I don't have to rummage through anything, I can see everything at a glance!! 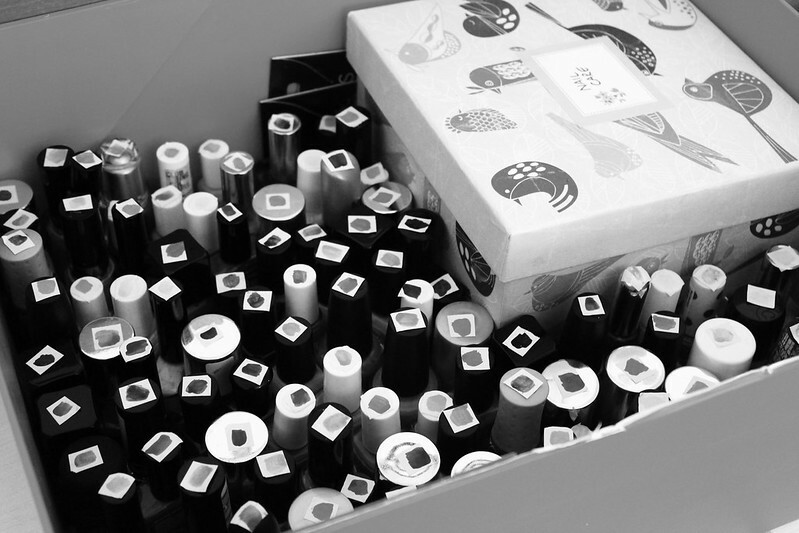 I used plain white sticky labels, cut them up, swatched the nail polish shade and stuck it on top of the lid. Voila! I saw this idea somewhere, I think it was on Pinterest but didn't pin it so can't find the link, luckily I registered it in my brain somewhere and was able to process it last night. 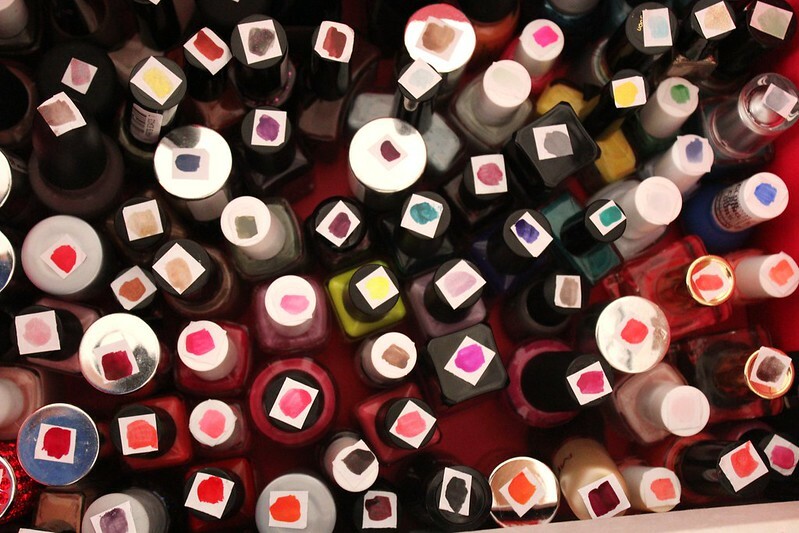 So happy I can finally store my nail polishes upright instead of sideways or upside down! :) In case you were wondering, this box lives under my bed. 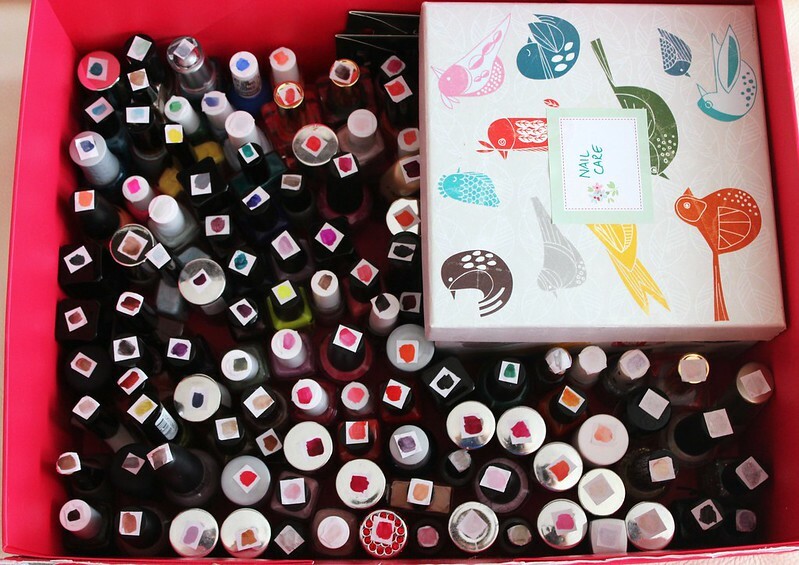 What do you think of this idea and how do you store your nail polish?